Last Updated: September 1, 2014 By Katie 23 Comments -- Paid Promotion. Disclosure policy here. Thursday night we decided it was time to try transitioning baby to crib. And oh man. I have to be honest here. If it was up to me? 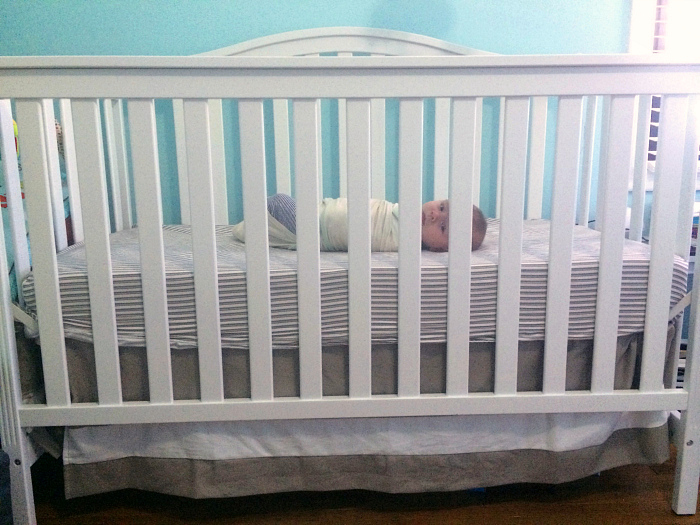 He would still be sleeping in his bassinet next to our bed for… um… err… indefinitely? ;) NO, but really. The only only only reason we moved him to his crib is because we were literally forced to do so. And that sounds maybe more dramatic than it is, but I’m feeling dramatic. Really, he just grew out of his bassinet, the poor thing. We kept putting him in there, and each night it seemed his little feet were inching closer and closer to the edge and eventually he would just be this scrunched up little baby in a bassinet that is entirely too short for him. But we’re good parents, so of course we didn’t let that happen. We got him out of there juuuust in the nick of time. Literally, the feet were touching, that’s how close he was. So anyway. We were forced to move him into a more size-appropriate bed, which just so happens to be his crib. In his room. Which is approximately 10 feet from our bedroom. But that’s a lot of feet when he has been sleeping within arms reach for his entire life. Which again sounds more dramatic than it is, since he is only 4 (almost 5) months old. Again, I’m feeling dramatic. Let it be. So the crib transition was an emotionally tough one for both me and Zack. Our sweet baby is growing up! And moving into his crib! WHAT?! But you know what? It’s great. I can’t believe I just said that, because I loooooooved having him in his bassinet next to our bed. Like, loved it. All of those late night feedings and the sheer comfort of knowing he’s safe, just right there next to me. It was great. And I was convinced we would leave him in there until he was like 9 months old. But again, the whole size factor. Baby needs some room to stretch. As do we all, right? But now that we ripped that band-aid off and put him in his crib, I think we’re all seeing just how great this is. He’s sleeping (pretty) great. He’s got room to move around (the first night he started with his head facing in one direction and woke up having done an entire 180 with his head facing the opposite end and it was pretty adorable just picturing him scooting around in a circle in his crib), he’s in his own little nursery that I so meticulously decorated just for him and we no longer have to tip toe around in our room when we are getting ready for bed ourselves. Plus, we have a baby monitor, which I don’t care how small your house is, is a MUST HAVE for babies. So how did it go? Well, the first night wasn’t very good. He kept waking up crying every half hour or so and didn’t finally go down for “bed” until 11:45. Yes you read that right. I know. The next night was a bit better, as we had begun having him nap in his crib all day, too, therefore he was a bit more ready for it I think, and he woke up a few times crying again but went down for bed at 10:30 this time and stayed asleep for a good 6 hours, woke up to eat, and went right back down for another 3 hours. That’s success in my book! The following night was even better, with him going down at 9:30 and waking only once to eat and then back to bed. When did you move your baby to the crib? 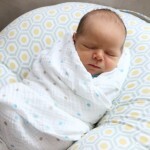 I laughed hard at Sam giggling in his tiny bassinet! He was definitely snug in there, but it sounds like overall you guys had a smooth transition, so that’s great! 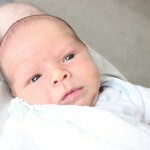 I don’t have any little ones, but we aren’t TOO terribly far off from thinking about expanding our family, so I love reading other moms’ experiences! Sam sure loved that bassinet! ;) But yeah, I guessss when his toes start touching, then it’s time to move on to bigger and better things! I moved both at about 10 weeks. I can’t even remember the reasoning but I do remember being a little freaked out about it at first. All was fine though. Yes, baby monitors (video) are quite nice. I used one with my first until she was 2.5 years old!!! Ohhhh he is so cute. I’m glad the transition wasn’t too difficult for you guys. 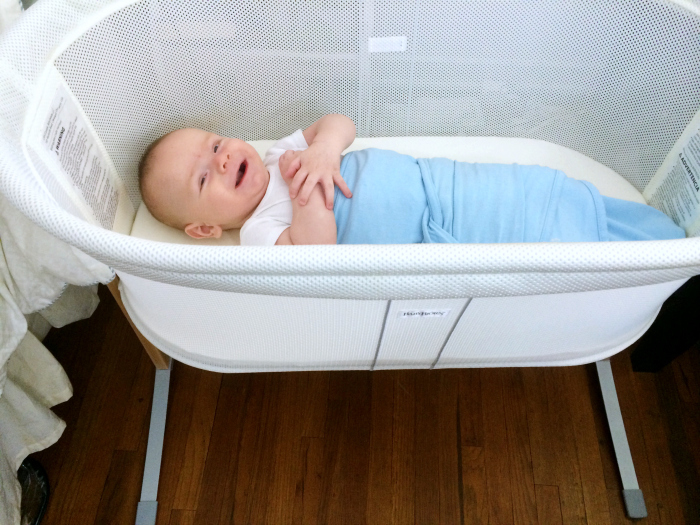 I have friends who had an absolute nightmare of a time switching from bassinet to crib! So good job Sam! Ahhh I was worried it would be a tough move, but Sam took it like a champ! :) He likes his new digs! Glad it went well for you!! 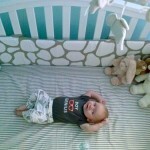 It really is amazing that everyone does seem to sleep better once baby is in his own crib! ;) Even though it was a tough move for me to make, I know it was the right one! Way to go!! We need to work on moving baby out of his swing to sleep in his bassinet. 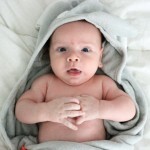 Then on to the crib….Glad to hear it was a pretty great transition! Sam Sam is the man! What type of bassinet is it?! You are so brave!!! Hallie is totally ready! She has been sleeping through the night for a while….but I am chicken! We moved our little man at 12 weeks. We started all naps at 10 weeks in the crib. Our little man was out growing his bassinet as well. I also wanted him to be sleeping in his crib by the time I had to return to work. He still wakes up a few times, but the paci back in and a sweet shhhh he is right back to sleep. So smart to start naps in the crib before moving! And being able to soothe them back to sleep is one of my favorite things! Oh my goodness, what a good crib transition! Our transition has taken months ah! Hi I’m about to transition my baby into his own crib, but every time I’m attempting to do so, he really cries and won’t let us sleep. 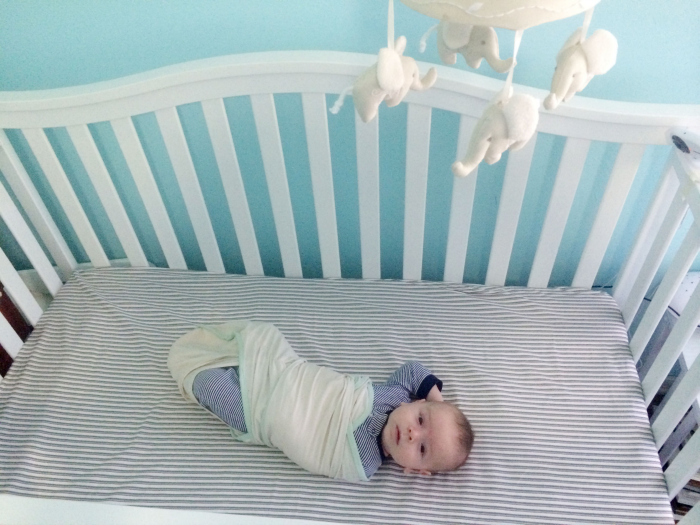 Do you have any tips on how to make your baby love to sleep in their own crib? I have found an easy and fast method to deal with transitioning my baby to a crib in Susan Urban’s short ebook “How to teach a baby to fall asleep alone” ( got it here: http://www.parental-love.com ). After 2 days of the method my daughter started to fall asleep in her crib without rocking her and after another one day she stopped waking up at night! The method is gentle and without CIO so perfect!